After nearly six months of basketball, from practice to the podium, the 75th and final RTC Podcast of the 2013-14 season is here. It’s been quite a run, filled with analysis, wild predictions, #cheerfortheears, more analysis, numerous fantastic guests, a bunch of informative correspondents, and even a few t-shirts thrown in. While we exhausted ourselves in some respects by plowing through at least a couple pods per week, we feel like it was well worth the time and energy, and we certainly appreciate all of the listeners that tuned in along the way. For the offseason, we expect to check in at least once every few weeks, depending on when there are enough things to talk about, but we’ll definitely be back when the NBA Draft deadline has passed. In this week’s podcast, we break down the National Championship game, consider UConn’s future and talk about some of our memories from the preceding season. The full rundown is below. Give it a listen. Make sure to subscribe to the show on iTunes so that you’ll get all of the episodes immediately downloaded to your listening device. It’s time to put a bow on the 2013-14 college basketball season, with our final NCAA Tournament Tidbits post on the aftermath of Monday’s National Championship. There’s no doubt Shabazz Napier was one of the premier players in college basketball this season, but what impact will he make at the next level? His lack of size and wealth of production will make him a very intriguing NBA Draft prospect. Kentucky will always lose numerous players to the NBA Draft, but it will still usually be back among college basketball’s best every season. However, if coach John Calipari makes the jump to the NBA, the Wildcats could be in trouble. From 340 teams down to a solitary C, and it turns out that the blue glow behind Connecticut‘s logo held some sort of supernatural meaning after all. And with that, the 2014 Circle of March has completed. We started on this journey some five weeks ago yesterday, and once again the beauty was in the process. Click the image to see the entire procession all the way down to one team standing. See ya next year. Elite societies are exclusive societies, and the true blue-bloods of college basketball have long been a part of a near-impenetrable coterie. They are the programs that need no introduction, the schools that we expect to see in preseason Top Tens, midseason games-of-the-week, and on the final lines of the bracket in March and April. With apologies to UCLA and Indiana (it has been too long since either school ended their season with a National Title), conventional wisdom would tell you that this dignified collection has included just four teams for quite some time now – Duke, North Carolina, Kentucky and Kansas. It has been a nice run boys, but it’s time to welcome another member to your group. 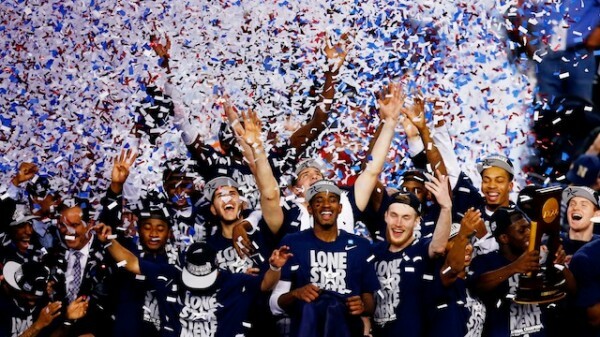 After winning its fourth national title in 15 years on Monday night — twice as many as any other school during that time — Connecticut deserves mention in any conversation of the elite college basketball programs in America. With Jim Calhoun watching from the stands and Kemba Walker on a television set far away from Dallas, Kevin Ollie, Shabazz Napier and the rest of the Huskies proved – against perennial power Kentucky, no less — that the UConn program is as elite as any in college hoops. Jim Calhoun has long been synonymous with UConn basketball. After all, Calhoun took a program that was nearly devoid of basketball history when he got to Storrs in 1986 and turned it into a national power, winning 12 times as many NCAA Tournament games in his 26 years (48) as the program had in the 85 years that preceded his arrival. Among those four dozen Tournament victories were three national titles – a nearly unthinkable feat when viewed within the greater picture of Connecticut basketball history. Many even called the Hall of Famer’s work in Storrs underappreciated when he retired in 2012, citing that blank program history and the bleak winters in tiny Storrs as major obstacles to a perennially elite college basketball program. Yet, somehow Calhoun was able to create precisely that. However, all good things must come to an end, and the Jim Calhoun era was most certainly a good thing. His departure in 2012 brought a fork in the road for the program. One route would have been a trip back to a quiet, defeat-ridden past, where three decades of sustained brilliance would have ultimately come to reveal little more than the immense proficiency of one fantastic head coach. The other fork was more intriguing, one where continued success might actually show that Calhoun had done more than just coach a bunch of great teams. If UConn continued their winning ways, Calhoun’s legacy would be that of a program builder; he would have taken a bad job and turned it into one of the sport’s best. Rush the Court is covering the Final Four from Arlington, Texas, this weekend. Shabazzketball. Shabazz Napier said after the game that he told his teammates back in a January home loss to Louisville — the first of three to the defending national champs, none of which were close — that he believed in his team and that they were going to make a run to eventually win the National Championship. While there’s no way to know if Napier is joshing us or simply retelling a tidbit that the team probably repeated many times during the season, the salient point is that Connecticut fulfilled the prophecy to once again raise the gold trophy for the fourth time in 16 seasons. The brash, cocksure point guard from the Boston area is the primary reason why. Napier’s 22 points (including four big threes), six rebounds, and three steals have become par for the course throughout Connecticut’s run to the title, but on a night when the team needed a first half lift because DeAndre Daniels was slow getting started, Napier’s 15 points allowed the Huskies to build an early cushion to put the pressure on Kentucky to make yet another second half comeback. The comeback happened twice, but each time that the Wildcats had whittled the lead down to one point, Napier had an answer. His first response was right out of the half, when he drove into the lane to earn two free throws (both makes, of course); the more important second instance was with six minutes remaining, when it appeared that UConn was wearing down and the Cats were surging forward. Napier put an end to that notion with a calm and accurate three-pointer to push the lead back up to four. After a subsequent Randle two and Giffey three, Kentucky never got closer than four points for the rest of the game. There aren’t many players these days who stick around long enough to win two national titles, and especially three years apart, but Napier has certainly proven that he belongs among the list of greats for his performances in March Madness. 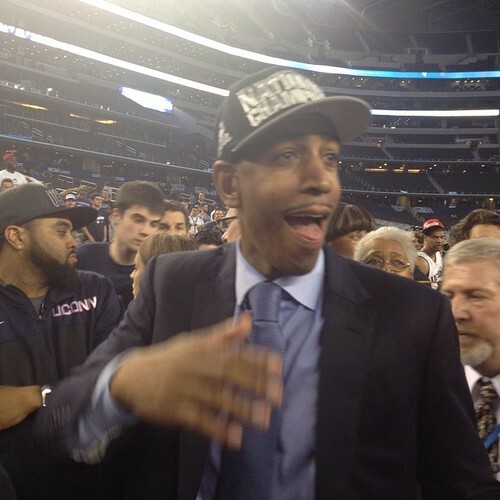 Kevin Ollie Bum Rushes the Tourney. The last time a coach won the national title in his first appearance in the NCAA Tournament, the year was 1989 and Michigan’s brand-new head coach Steve Fisher led Glen Rice and friends on a magical run to victory. Kevin Ollie had a little more experience coming into this year’s Dance than Fisher was awarded some 25 years ago, but he should absolutely be commended for the belief that he instilled in his players and the resolve that they exhibited on the court during this Tournament. They beat teams bigger than them, more physical than them, deeper than them, better shooters than them, and more experienced than them. What you’re going to read about a lot in the next 24 hours is how it was UConn’s defensive commitment and resolve that won the school its fourth championship. While the Huskies played excellent defense in the gut-check games against the likes of Michigan State, Florida and Kentucky over the past 10 days (holding the three teams to 0.90, 0.93 and .90 points per possession), it was actually the hyper-efficiency of UConn’s offense that made the difference. Over the six-game NCAA Tournament run, Kevin Ollie’s team never dipped below a 1.00 PPP average (vs. Michigan State and Kentucky), and it maxed out with a necessary 1.24 PPP mark against St. Joseph’s and a 1.23 PPP mark against Iowa State. It’s not a true calculation because every game is different, but some back-0f-the-envelope math suggests that the Huskies averaged about 1.11 PPP in its six wins while holding opponents to 0.99 PPP on the other end. And it did so against five of KenPom’s top 20 teams, with the strange outlier the game against St. Joseph’s that UConn very well could have lost. Crazy. Kentucky’s Magical Run Ends One Game Short. This Kentucky basketball season was without question one of the strangest that we’ve ever experienced. The highs and lows of it were simply astonishing. From a preseason #1 ranking and at least mild entertainment of the idea of an unbeaten 40-0 season, to the harsh reality of non-conference losses to Michigan State, Baylor and North Carolina, to head-scratching but not awful SEC losses to Arkansas, LSU and Florida, to end-of-season disasters vs. Arkansas in Rupp and on the road at South Carolina and Florida, to The Tweak before the SEC Tournament and a solid performance there, to the subsequent three weeks of phenomenal play — especially at the end of games against high-quality competition — that ran all the way to the verge of a National Championship. Life is stranger than fiction, and it certainly felt coming into tonight that all the jabbering about 1-and-done and right way/wrong way and the rest of the related nonsense surrounding John Calipari and how he runs his program was going to be finally put to rest. Alas, UConn had other ideas. Regardless of tonight’s outcome for the Wildcats, there’s absolutely no shame in a runner-up finish, and most Kentucky fans would have taken that in a heartbeat in early March. 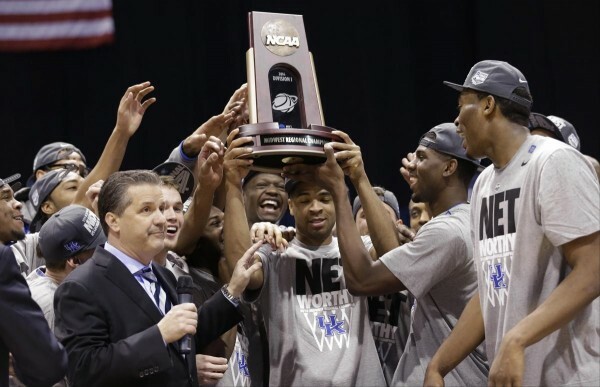 As for Calipari, this was without question one of his finest coaching jobs — he very nearly lost this team at the end of the season, but he was able to use his magic wand to get their attention, buy into his conceptual framework of team and selflessness, and damn near ran his team to another National Championship. Because of his recruiting prowess, he doesn’t get the credit he deserves, but he’s a top-five coach in this game no matter how you slice it. Saturday night’s wild finish between Kentucky and Wisconsin offered yet another poignant display of the vast range of emotions that this Tournament is capable of causing. While the Wildcats celebrated another stirring victory, the Badgers saw their season end in the most sudden, grief-inducing of fashions. 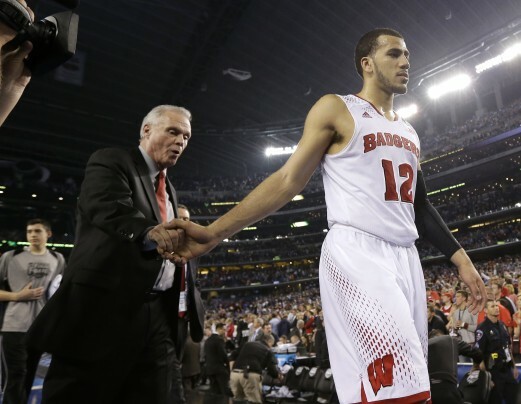 Bo Ryan’s team was seconds away from heading to the National Championship game as favorites. One seismic moment later, and both season and dream were finished. 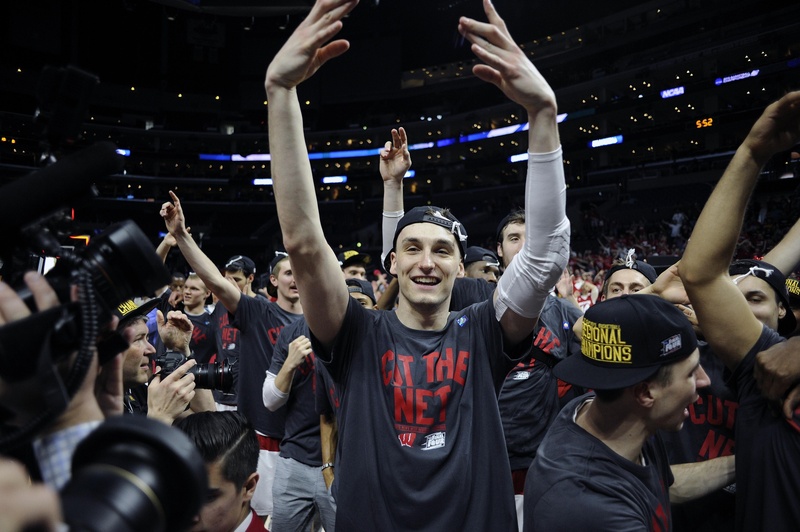 So is life in the emotional rollercoaster that is the NCAA Tournament, but less-than-glorious conclusion notwithstanding, the Badgers accomplished plenty this season. In the wake of Saturday night’s classic, here are three thoughts on Wisconsin’s 2013-14. Even after a brilliant season, to ignore the Badgers’ missed opportunity would be both near-sighted and disrespectful. Of course, Kentucky had much to do with seizing victory from the Badgers on Saturday night, but Wisconsin should not be misconstrued as a “had a great run, was just happy-to-be-here” type of team. Final Fours don’t grow on trees, especially during those chilly Madison winters (this was just the program’s third national semifinal appearance), but this Badger team was talented, well-coached and legitimately elite. They had every right to believe that they could leave Dallas as champions – especially after Florida fell in the first semifinal. Wisconsin should be lauded for a fine season, but frustration is only fair when visions of a National Championship were as salient as they were for the Badgers. Next season, the Badgers’ senior backcourt tandem of Traevon Jackson and Josh Gasser may be the toughest, most experienced pair of guards in America. The duo will be forever frozen on the wrong end of Final Four history – Jackson for his missed jumper on the game’s final possession, Gasser for his contest of the Harrison jumper – but both Badgers were integral pieces of this run, and will be cornerstones for Wisconsin success next winter. Wisconsin diehards had to know who would be taking the final shot before it happened, as Jackson has developed into a late-game go-to guy for Bo Ryan over the past two seasons. Clutch and accurate (he shot 38 percent from behind the arc this season), Jackson’s three seasons of experience have also aided his development as the perfect conductor for Ryan’s swing offense. His classmate Gasser is equally learned in the intricacies of the Badger system, although Gasser’s main value is on the defensive end of the floor. That’s saying something after a season in which he posted an O-rating of 128.6 (24th-best in the country), but Gasser will be back next year to continue his harassment of the best wings in the Big Ten. Kaminsky! So, yea, the hype surrounding Frank the Tank may have been slightly outsized after his scintillating 28-point, 11-rebound Elite Eight performance. I’m not sure how much of this has to do with the fact that Turner has a studio crew that has watched exactly zero college basketball before March (hi Charles! ), but Kaminsky appeared to have become the second-coming of Dirk Nowitzki for the past seven days. Dirk he is not, but Kaminsky’s presumed return to Madison is a game-changer for the Badgers. His offensive versatility makes him a unique weapon in the college ranks, and with Nigel Hayes’ rugged athleticism offering a nice complement, Wisconsin’s interior (especially offensively) will be difficult to handle in 2014-15. Hello, friends. There is only one college basketball game left in the 2013-14 season, and it will be played to crown a most improbable national champion and end a three-week long soap opera. Sorta like the original Dallas. 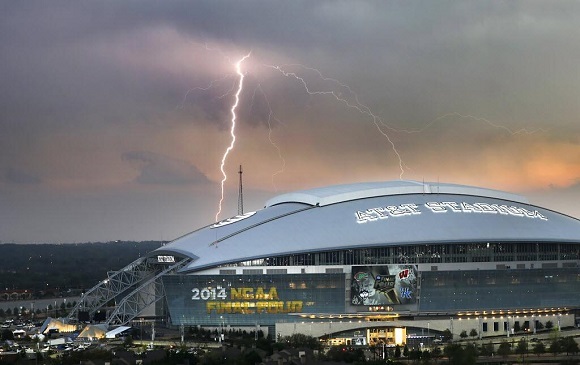 Great shot from Tom Fox on Final Four Eve as “North Texas” weathered a brutal thunderstorm. CBSSports.com‘s Matt Norlander made good after being on the losing end of a season-long bet made with Rush the Court‘s Randy McClure. Despite an early exit from the tournament, Wichita State made it to the big dance with a fat zero in the loss column. Norlander (pictured, right) didn’t think that would happen. So, as a result, he had to wear a set of bunny ears out on the town at the Final Four. He looks good. Maybe even better than NBCSports.com‘s Raphielle Johnson (left) and Rob Dauster (center).